Shut Down Stop & Shop! 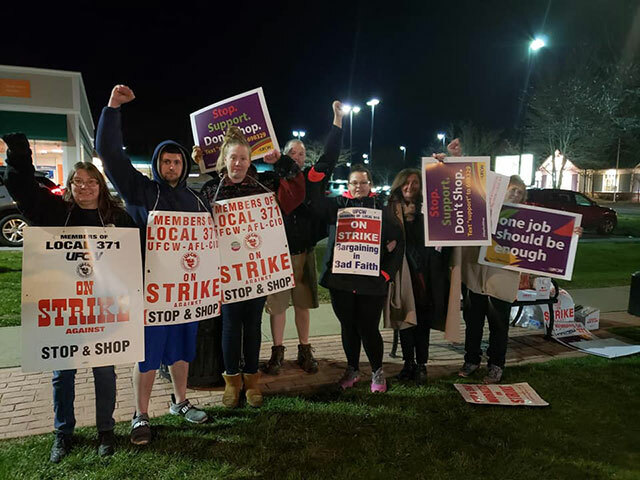 APRIL 12 – After much delay and with much anticipation, tens of thousands of workers at supermarket chain Stop & Shop organized in five different locals of the United Food and Commercial Workers (UFCW) union have gone on strike in Massachusetts, Connecticut and Rhode Island. Strike authorization votes passed by wide margins earlier in the year, yet it has taken until now, with the company’s provocative “final offer” – including drastic cuts to take-home pay, cutting vacation weeks and wages, increasing health care costs passed along to the employees, etc. – for the union tops to pull the trigger. Now, finally, THE STRIKE IS ON! 31,000 workers at 240 stores across New England have their livelihoods at stake. All of labor, working people and defenders of workers’ rights must pitch in to WIN THIS FIGHT. The company is threatening to bring in “replacement workers” – scabs – in an attempt to break the strike. What’s needed to stop these arrogant and greedy bloodsuckers in their tracks is to mobilize all of New England labor, and their allies, to build mass picket lines that nobody dare cross! Stop & Shop claims that average pay is $21 per hour, which is way less than what’s needed to make ends meet. You can’t raise a family on that. Yet S&S cashiers in Massachusetts make on average less than $16,000 a year, and part-time workers in Local 919 with eight years on the job earn less than $13 an hour – says the company! Meanwhile, S&S’ parent company raked in over $2 billion in profits last year. Stop & Shop workers need a big raise just to take account of increased costs due to inflation. No to a wage cap! All workers need full health-care coverage, paid for by the employer, not skyrocketing medical bills. No concessions! Workers have fought hard over many years for defined-benefit pensions, adequate paid vacation time, and premium pay for Sunday work. No givebacks! Lower wages and benefits for new hires only serve to divide workers and fatten company profits. No divisive two-tier contract! Throughout New England, the Teamsters Union, who represent Stop & Shop warehouse workers and drivers, have declared that they won’t make deliveries or cross picket lines. We applaud this recognition of union solidarity – and call for more! Hotel workers in Connecticut have declared that they will refuse service to scabs shipped in to bust the strike. This is the type of action we need to win, not appeals to the bosses’ mediation courts or local Democratic politicians. All workers and their allies among the oppressed must rally behind the embattled UFCW workers and shut down Stop & Shop! 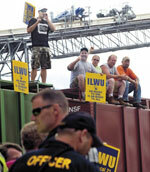 Across the country, the largest wave of strikes since the 1970s is in progress. It began last year with teachers and other education workers in West Virginia, and moved onward to school districts in Oklahoma, Arizona and Colorado. Locally and across the country, it continued with the successful Marriott hotel strike in Boston and elsewhere. Since then, Boston-area hotel and dining hall workers have benefitted from the Marriott strikers’ struggle with improved contracts. Teachers struck again this year in Chicago, Los Angeles and Oakland, California. Meanwhile, across the southern U.S. border in Matamoros, Mexico, tens of thousands of horribly oppressed workers in the maquiladoras (free trade zone plants producing for the U.S. market) struck in defiance of courts and cops and their own misleaders, winning a 20% raise plus half a year’s back pay. The strikes there are continuing at a Coca-Cola bottling plant where strikers have camped out at the entrance, with 24/7 picket lines that scabs cannot, because they dare not, cross. This underscores the international scope of the struggle between capital and labor, between the workers whose blood, sweat and tears generates the profits that the bosses accumulate. UFCW leaders plaster the Stars and Stripes banner of U.S. imperialism on picket signs. They appeal to U.S. nationalism at rallies decrying Stop & Shop’s Dutch parent company, Ahold Delhaize, calling for keeping profits in the US. But strikers must understand that their allies are the oppressed and exploited workers all over the globe in all lands, not the bosses and their politicians in the United States. In particular, workers in the United States they must organize in defense of our immigrant sisters and brothers. UFCW-organized plants have been repeatedly raided by the I.C.E. kidnappers. Last summer, 150 men and women at the Fresh Mark meat-processing plants in Ohio were ripped from their families. The UFCW has joined other unions in forming the Working Families United coalition to defend Temporary Protected Status recipients under the gun from the vicious Trump administration. But words and billboards are not enough, and appeals to Democratic politicians are worthless, as they have proven themselves just as anti-immigrant as the Republicans, militarizing the border and deporting millions. Instead, what’s needed are workers actions to stop deportations! In the New England area, we call upon Stop & Shop strikers to take up the cases of Wayzaro Walton in Hartford, Connecticut; Siham Byah, in Boston; Akana-by Adjenodar in Lowell, Massachusetts; and so many others. Workers of the world, unite! Stop & Shop has pointed to the fact that they are the only fully unionized grocery store chain in New England, and claim that they need to cut costs to stay “competitive.” This BS underscores the pressing necessity to launch organizing campaigns at Aldi’s, Big Y, Market Basket, Shaw’s, Walmart and Whole Foods, among others. Organize the unorganized! The UFCW tops have already shown too much temporizing and foot-dragging since January in their negotiations with the company. Strikers should elect rank-and-file strike committees to wage the hard class struggle necessary to win this fight! No reliance on Democratic Party phony “friend of labor” politicians; mobilize Teamsters and teachers, UNITE-HERE hotel workers, USW gas workers, CWA and IBEW phone workers, and SEIU and IAM airport workers to BUILD MASS PICKET LINES TO SHUT DOWN STOP & SHOP! Victory to the UFCW Stop & Shop strikers!